It’s one thing for us to claim we deliver excellence at JH3 Company. It’s another to hear it from our customers in their own words. Over the years we have earned dozens of 5 star customer reviews published on review sites like Angies List, Yelp and BBB. Below are their words of praise. If you want to write us a review directly, simply scroll to the bottom of the page and complete the form. We greatly appreciate your thoughtful comments. Rated 5 out of 5 based on 11 reviews. JH3 repaired my (Jim Cui)roof twice (my house is on West Hills, CA). Each time, Chris along the folks showed up on time and did a very good job. They are professional and nice people. We moved into a new house in the Oaks, Calabasas and discovered a leak in our roof during the rainy season. Due to their tremendous experience over the years, Joe and Chris, after looking closely at how tiles were laid previously, found that our house had a major error in the structure of the roof. Not only did they help us go back to the seller (years later) to prove the error they had discovered, they went steps much further to help us understand what went wrong and where costs had been incurred. They came to our rescue (multiple times during torrential down pours, had unbelievable craftsmanship and follow up, secured our roof, recommended the most cost effective ways to fix all the problems (they could have billed us and made more money but instead suggested we go through different specific vendors). They continually checked in (over the course of a 6 month process), to make sure tiles weren’t cracking from other workers (and didn’t even bill us for this!) and followed up to make sure that everything stayed in good working order until they finally came back and put back on the tiles when we were ready. They also took the extra time to clean all the tiles and get the stucco/ paint off of the roof tiles that our painters messily left everywhere. They continually all went beyond the call of duty, were professional, respectful, extremely knowledgable and affordable. I am so grateful we went with them and would not think twice if i were in need of anything that they were capable of doing! Thank you to the whole team! The best! Chris supervised the installation of a very complicated roof on a custom home I built in Silver Lake three years ago. The bulk of the roof is flat and the PVC roof he recommended and installed is superb. 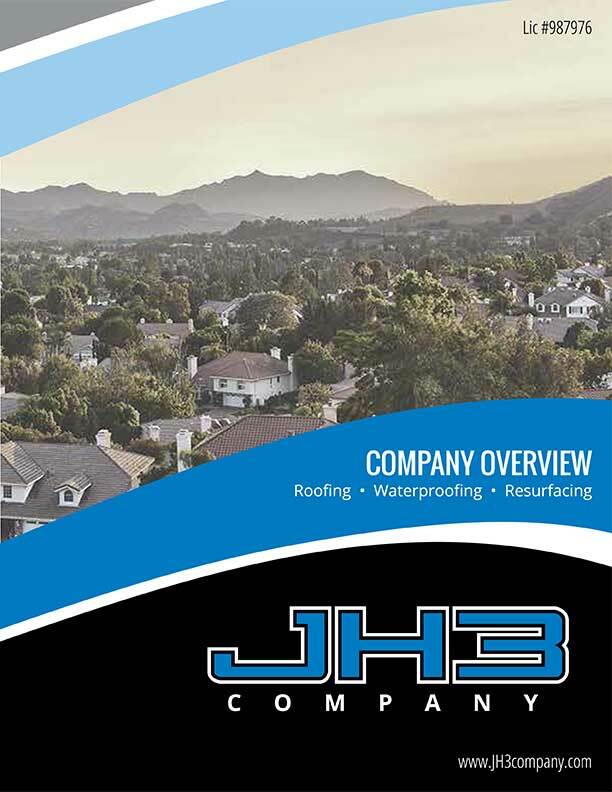 Hi, I have used JT Harris, Inc (now JH3 Company) three times in the “life” of my roof – two were for inspections and tune ups and one was to cut a part of the roofline to make room for a travel trailer. I have always been happy with their work. They are pleasant to work with, prompt, thorough and clean up the site beautifully. I always feel confident with their estimates and never feel “taken advantage of”!! Their recommendation this time was for a tuneup before El Nino and then to consider a new roof in the Spring. I’ll be calling on them again! As a Professional Real Estate Agent, our Team works with many Contractors. The staff at JT Harris (now JH3 Company) was Second-To-None. Fast, Friendly and Reasonable. Quality work and excellent communication between their staff and our clients. Will use JT Harris again. Thank you. Fill out the form below and you will receive follow up instructions to download our company brochure (PDF). 5 star local reviews from JH3 customers. Get the financing you need for a roofing, waterproofing or resurfacing project at home or work.